On Tuesday, July 3, President Hassan Rouhani implicitly threatened to close the strategic Strait of Hormuz and prevent countries from exporting their oil through it if Iran was not allowed to sell its own oil due to US sanctions. Shortly after, the Islamic Republic’s military officials explicitly supported this threat. Though Rouhani refused to clarify his statement when asked about it afterward, the comments were seen as a threat to close the Strait of Hormuz, the gateway for about 25 percent of the world’s total oil exports and for more than 40 percent of the world’s seaborne crude. 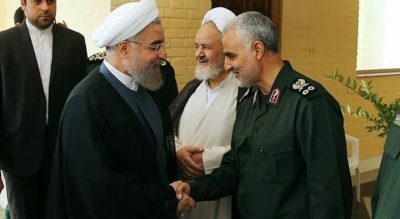 On July 4, General Ghasem Soleimani, commander of Iran’s expeditionary Quds Force, praised Rouhani for his stance. “I kiss your hand for expressing such wise and timely comments, and I am at your service to implement any policy that serves the Islamic Republic,” he said in a letter to the president. And Esmail Kowsari, another senior commander of the Revolutionary Guards, was even more explicit. “If they want to stop Iranian oil exports, we will not allow any oil shipment to pass through the Strait of Hormuz,” he was quoted as saying. Such threats by Iran are not unprecedented. Whenever tensions with the US have increased, Iranian officials have threatened to close the Strait of Hormuz. It happened prior to nuclear-related sanctions being imposed on Iranian oil, but the dispute was later resolved when the nuclear agreement, officially known as the Joint Comprehensive Plan of Action (JCPOA), was signed. At that time, General Hassan Firouzabadi, then the Chief of Staff for the Iranian Armed Forces, put forward the possibility of closing the strait and said that the decision rested with the Supreme Leader Ayatollah Khamenei as the commander-in-chief. This was during the administration of US President Barack Obama. Now that President Trump has withdrawn the US from the JCPOA and is about to re-impose sanctions on Iranian oil, Islamic Republic officials are renewing their threats — albeit in a milder tone. The Strait of Hormuz is an international waterway, with Iran on its north and Oman to its south. At its narrowest point, it is only 50 kilometers wide. If Iran is serious about closing the strait, is the move legal under international law? The simple answer to this question is no. Based on the international laws of the sea or the 1982 United Nations Convention on the Law of the Sea [PDF], Hormuz is an “international strait” because it is the only gateway between the Persian Gulf and the open sea. In all such straits, all ships have the right of transit and the countries adjacent to the strait must not deny this right of transit and must inform all relevant officials about any danger that might threaten the vessels or planes that travel through the strait. Under international laws and conventions, the right of transit cannot be suspended. Iranian parliament has not approved the 1982 UN convention, but the Iranian government has signed it and so is thus committed to avoid any action that would violate the convention. However, at the time that Iran signed the convention it announced that it would only recognize the “right of transit passage” for countries that had also joined the convention. Since the 1980-1998 war between Iran and Iraq, when military clashes occurred in the Persian Gulf and free navigation in the area was threatened, the US Navy has deployed its forces in the Persian Gulf to protect shipping. The United States is not a signatory to the UN convention, and, based on what the government of Iran declared at the time of signing it, Iran does not recognize the “right of transit passage” for the US. However, the US has a different interpretation of the convention and says that the right is now part of the “common law” of international navigation and all countries, including Iran, must abide by it. From Iran’s viewpoint, the United States benefits from the rights declared in the UN convention without being a member and without having to observe the obligations of its member states. These different interpretations are one of the underlying reasons for recurring tensions in the Persian Gulf between Iran and the United States and their respective navies. The US insists that its navy is in the Persian Gulf to guarantee freedom of shipping. Even though it has been 30 years since the Iran-Iraq War ended and during these years no hostilities of any significance have occurred in these waters, the US has kept its presence in the Persian Gulf to ward off threats, including threats to close the Strait of Hormuz. Shipping in the Strait of Hormuz is regulated by the International Maritime Organization (IMO), a UN specialized agency. According to the rules set by the agency, when entering the Persian Gulf, ships must do so by sailing in through the north, meaning through Iranian waters. When leaving the Persian Gulf, they must go through the southern waters next to Oman. In crossing the strait, even submarines are not required to surface to display their flags. The countries adjacent to a strait must take all actions necessary to facilitate shipping, including navigation services and signals for guiding ships. Of course, they can recoup the expenses through duties. In the case of the Strait of Hormuz, Iran and Oman can set rules for the safety of shipping, fishing and other such activities and declare them publicly, but these rules and regulations cannot violate the “right of transit passage” or discriminate against ships of any country. So, based on international law, Iran cannot block access to the Persian Gulf through the Strait of Hormuz and suspend or close down the freedom of commerce in those waters. Intentional blocking of the Strait of Hormuz and preventing ships from crossing through it is a serious measure with potential consequences. At its most serious, it could signal the start of armed hostilities in the Persian Gulf.